I’m only writing about this because it isn’t the tragedy it could’ve been. 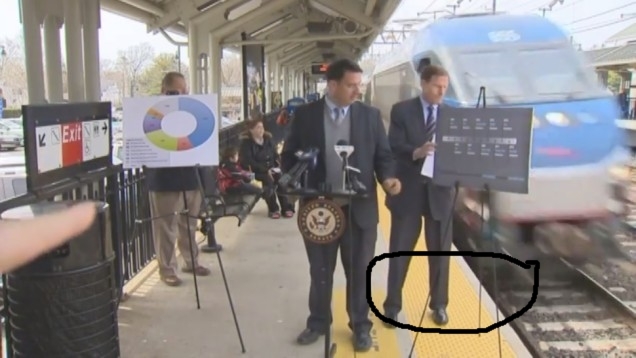 Sen. Richard Blumenthal was nearly hit by a train during a press event highlighting, ironically, commuter safety. Gawker has the story. Public places are ripe for disastrous press outcomes (they do, however make for hilarious YouTube clips). Unless you can section off an area, you don’t know who — or in the case of the train, what — will wander into your shot. If you’re doing a press event in a public place, control as much as you possibly can. Sometimes your boss wants something that you know won’t be good. When push back fails (and you should be pushing back against bad ideas), you make the most of a bad situation. That said, it’s helpful to follow some common sense safety precautions — like not standing on the yellow line. The train speeding by is a nuisance that can be edited out. An inch or two more to the left and you have a fatality captured on film. Visuals are phenomenal and the television media loves them. The displays, however, leave much to be desired. The text is tiny and other than being able to tell the one on the left is a chart of some sort, I’m not sure what message is being sent. If you’re going to use displays, make sure the text is large enough to be seen. It also helps to provide the media with copies of visuals that can be easily copied and pasted to the web, reprinted in the paper or used for broadcast (which was probably done here). When doing advance for an event, we have the unenviable task of seeing into the future and figuring out what the event will look like to our clients and the media. That includes what will go right and all the things that could possibly go wrong.